Aside from booking your flights and arranging your accommodation, the secret to a smooth, enjoyable trip is in the packing. No one likes to get to a destination only to have to scramble for the essentials. Local currency, spending cash, credit cards and important documents – you can't get too far without them, but they're all too easy to leave behind if you're swapping out your go-to purses and bags for something more portable. Men are actually more likely to forget their passports than women, according to AA, so remind the mister in your life to double check! While you can alleviate motion sickness through tricks like focussing on a stable object (such as the horizon), it's never a bad idea to stock up on first aid items. Bandages, painkillers, allergy aids, sunscreen and other staples will allow you to sweep in and remedy unexpected issues before they start interfering with your holiday or business venture. Most of us would be pretty lost without our mobile phones, and having other gadgets like music players on hand can be comforting as well. While it can be a relief to unplug for a while, be sure it's intentional if you do jet off without your devices. Think about what you'll want to use once you arrive at your destination. Planning to sight see? Consider bringing your camera and some binoculars. Spending time out under the bright blue sky? Take along your sunglasses. Maps, phrasebooks and itineraries may also be in order. Don't forget about the journey there, either. It's easy to focus entirely on the destination, but you may want to pack some items to help with the flight or car trips. Travel pillows help keep those neck cramps from creeping in, while sleep masks can actually lower your stress level and help you slip into dreamland faster. Print out Webjet's ultimate travel checklist and mark off the boxes as you go. That way, you can rest assured you're arriving at your final destination fully prepared to have an awesome time. For more help planning your next big adventure, book with Webjet, the leading online travel agency in New Zealand and Australia. 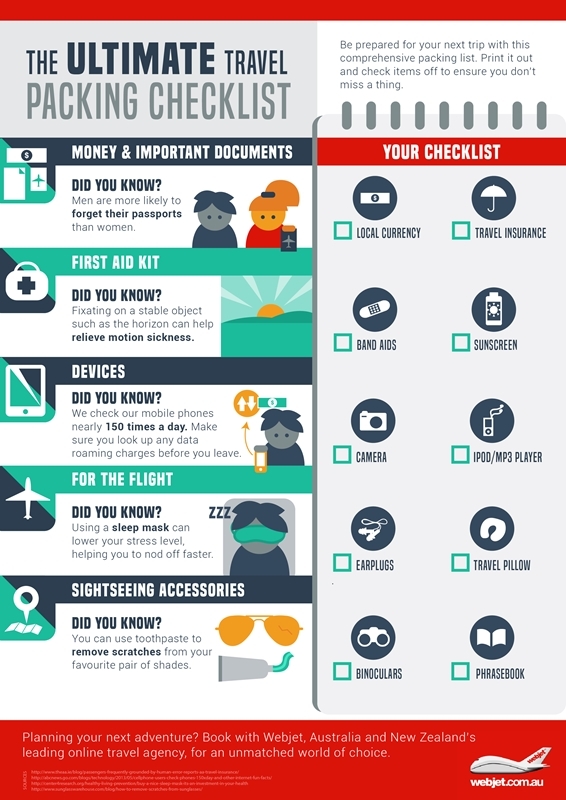 How many things have you ticked off the ultimate packing checklist?